This section of the website describes a few woodworking projects that I'm very proud of. 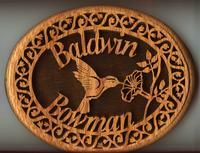 In January 2001, I made a name plate for my mother's front door using my scroll saw. Click the picture to learn about it. 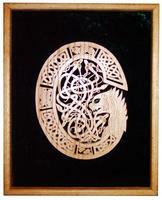 For Victor in 2001, I made an ornamental letter C based on design from the Book of Kells. Please click the picture to see it, and the story behind it. I made a wooden ornament for my nephew Jake for his second birthday. When we asked him what it was, he said, "J-A-K-E, Jake!"